This lesson can be used as a pre-lesson for the There’s No I in Theme-work! lesson plan. Students will be able to find and articulate the theme of a fictional text as a general life lesson. Students will be able to determine and write about the problem and solution in a fiction text with transition words using sentence frames. Tell students that today they will be learning about the problem and solution in fictional stories. Provide an antecdotal example of problem and solution, such as the following: "This morning, I poured a bowl of cereal for myself for breakfast. But, when I looked in the refrigerator, I realized I didn't have any milk. So, I decided to have a smoothie for breakfast instead." Explain that when you didn't have milk, that was a problem. But, when you made something different for breakfast, that was a solution. Introduce the vocabulary words for the lesson. First, display each vocabulary card. Then, read them aloud and have students repeat them. Display a blank copy of the Frayer Model using a document camera. Model how to complete it with the word problem by filling out each section. Include the definition in students' home language (L1) if applicable. Keep this example posted for student reference. Hand out a blank Frayer Model to each student and divide the class in half (i.e., draw an invisible line across the classroom). Instruct one half to work with a partner and complete the model for the word solution while the other half completes the model for the term transition words. 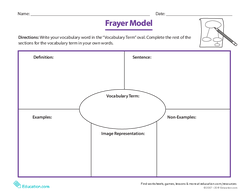 Tell students that during this time they are becoming a "word expert" and inform them that they will be sharing their Frayer Model with a peer. When students have completed their Frayer Models, have students find a new partner with a different focus word. For example, a student with the word "solution" should pair up with a peer who studied the term "transition word". Instruct students to take turns sharing their focus word with their new partner. Circulate and offer support as needed while students share their Frayer Models. Explain that, in fictional stories, authors often use transition words to introduce or connect problems and solutions. 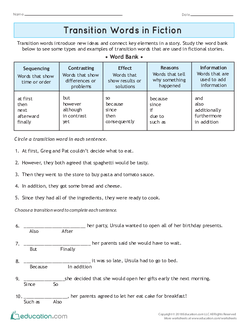 Display the word bank on the worksheet Transition Words in Fiction and review it with the class. Then, complete one example sentence on the worksheet. Hand out the worksheet and instruct students to complete it with a partner. When students are finished, invite volunteers to share their answers with the class. Hand out the worksheet Practice with Problem & Solution and display a teaching copy. Read the instructions aloud. Read the first short story aloud ("A Hungry Dog") as students follow along. Model your thinking as you find the problem and solution. Point out that the transition words "first" and "then" are provided to help write about the problem, while the words "so" and "finally" are provided for the solution. Instruct students to work with a partner to find the problem and solution in the two remaining stories. Call on volunteers to read their answers aloud to the class. 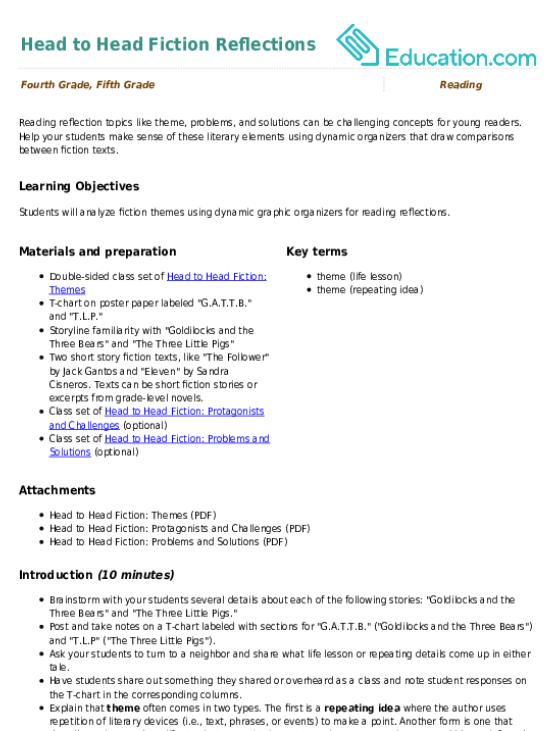 Pre-teach additional tier 1 vocabulary that students will see during the lesson, like "ingredients," "batter," and "baking soda." 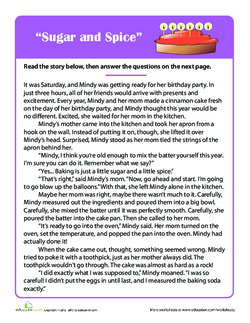 Before handing out the Practice with Problem & Solution worksheet, highlight transition words in the short stories to help guide students as they read and respond. 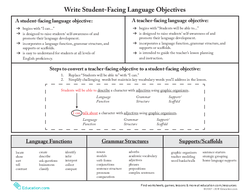 Allow students to respond orally during the discourse level focus activity, rather than composing a written response to each story. 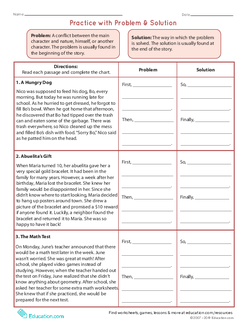 As students work with the Practice with Problem & Solution worksheet, encourage them to highlight the transition words they see in the short stories and discuss how the words are used to introduce or connect the problem and solution within each story. Hand out an index card to each student and instruct them to write about the problem and solution in the story. Make sure the story is visible as students work and provide a word bank with transition words for students to use in their responses (i.e., "first," "then," "so," "finally"). Invite a few students to share their responses with the class. 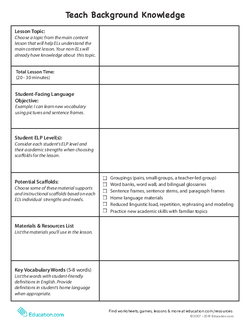 Collect student responses as exit cards and group their responses into proficiency levels to determine which students will need additional support with the concept. Hand out scratch paper and have students draw a picture or comic about a problem and solution. Model the activity by drawing a quick sketch of the problem and solution you shared at the beginning of the lesson (i.e., a bowl of cereal without milk next to a smoothie). Label your picture with the words "problem" and "solution." Encourage students to think about a problem and solution in their own lives or allow them to use an example they read about during the lesson. Have students share their drawings in small groups. 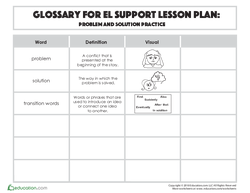 Use this glossary with the EL Support Lesson Plan: Problem and Solution Practice. 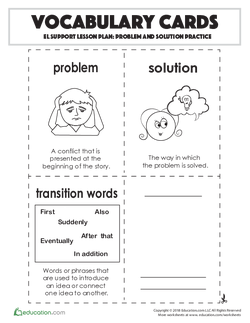 Use these vocabulary cards with the EL Support Lesson Plan: Problem and Solution Practice. 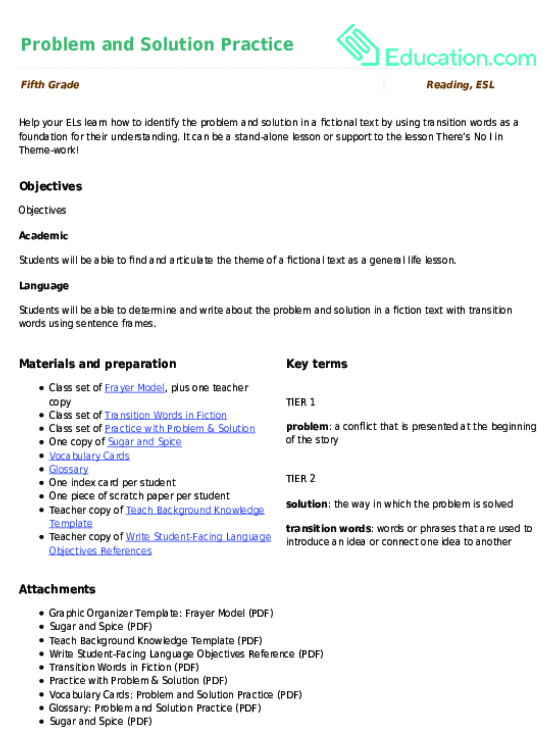 Help your ELs learn how to identify the problem and solution in a fictional text by using transition words as a foundation for their understanding.